It's on like, well, like Donkey Kong, in the ongoing saga of one of the world's oldest arcade games. Steve Wiebe , the reigning champion of Donkey Kong and one of the stars of the King of Kong documentary, will attempt to beat his own high-score of 1,064,500 to celebrate the re-opening of a Chicago hardware store. Wiebe will appear at Logan's Hardware when it opens on January 15th. Aside from the goods you'd expect to find in a hardware store, Logan's also has a collection of classic arcade machines, including the likes of Asteroids, Pac-Man and, of course, Donkey Kong. Wiebe will try to break his record three times over the course of the day, in ninety-minute play sessions, separated by half hour breaks. As well as his attempts to one-up himself, Weibe will also teach a short class about playing Donkey Kong, as well as take part in a Q&A session. Admittance is on a first come, first served basis, and costs $12. 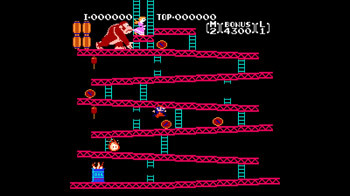 The battle to be Donkey Kong champion is pretty hard fought. Wiebe only regained the title from his rival Billy Mitchell in September, who in turn captured it only in July. Documented cases of players scoring more than a million points in Donkey Kong in public are few and far between however, meaning that it if Wiebe manages to widen the gap between him and Mitchell, it will be doubly special.